When looking into the night sky from the Southern Hemisphere, one of the brightest and most easily distinguished constellations you see is the Southern Cross. This simple, four-star pattern has great significance to the cultures of the southern hemisphere and is used for navigation the same way that Polaris is used in the northern hemisphere. The Southern Cross is referenced in the Australian and Brazilian national anthems, and also appears on the flags and dominates the folklore of Australia and New Zealand. Australia’s Southern Cross University (SCU) takes its name from the constellation that dominates the heavens above. An Australian public university with 17,000 students, SCU is committed to innovative teaching and research. The university offers degrees in business; arts; social sciences; paralegal studies; environmental science; nursing; preparation courses; and more, at the bachelor's, master's, and doctoral levels. Both on campus and by distance study, SCU emphasizes the combination of academic theory and practical experience to create good employment prospects for their graduates. SCU has invested heavily in advanced infrastructure for students and faculty in order to improve teaching quality, and is recognized throughout Australia for the quality of its support services. With four major campuses spread across Eastern Australia (Gold Coast, Lismore, Coffs Harbour, and Sydney) the construction of SCU's campus network was difficult due to its size and layout. SCU’s goal was to achieve quick resource sharing; timely information delivery; and a balance between development, first-rank teaching, effective learning (including on-line learning), and efficiency between campus offices and administrators. Each of the four campuses had an independent communications system that could not be easily managed in a unified manner. Routine maintenance was difficult and costly. The use of different applications between unconnected systems made for slow resource sharing and inefficient collaboration between students and staff. The natural response was for SCU to build a state-of-the-art unified communications system. An up-to-date communications infrastructure is a necessity for every modern university. However, it would have been costly for each of SCU’s campuses to build their own data centers and purchase communications equipment, and the institution would end up incurring an inordinate amount of maintenance work. In addition, as the campus infrastructure evolves, upgrades will be needed that will further impact internal and external efficiency. Universities around the world are asking the following questions: How can we save costs and improve communication efficiency? How can we quickly build communication capabilities that align with our teaching requirements? How can we improve the teacher/student experience? The answer to SCU’s questions was to deploy the Huawei Cloud Enterprise Communications (CloudEC) platform to build a high-quality teaching and office communications network. Two CloudEC platforms working in active-standby mode are deployed on the Lismore and Gold Coast campuses to implement remote disaster recovery. The CloudEC platform supports voice, video, and data convergence, and uses progressive communication to improve teaching and office experiences through HD video conferencing, voice calling, and mobile office collaboration. Local gateways are deployed at each of SCU’s four campuses to local outgoing voice calling and local regeneration to reduce communications costs and ensure service continuity. 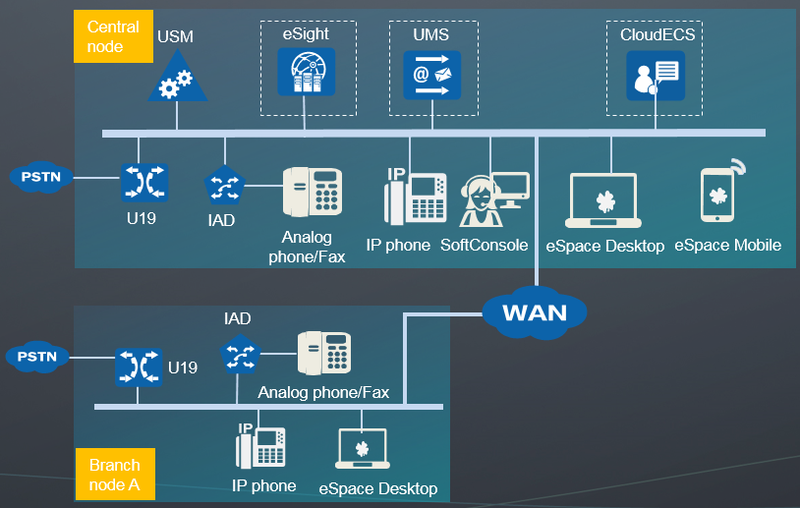 Integrated Access Devices (IADs) are deployed to connect legacy analog phones and fax machines to the new network, ensuring continued Return on Investment (ROI) and achieving smooth service upgrades. The web-based, unified eSight network management system supports centralized provisioning plus rights-based and domain-based management to simplify O&M and allow SCU's network administrators to focus on higher value assignments. IP phones affect plug-and-play convenience by automatically seeking the host server and configuring themselves accordingly. Following the deployment of the Huawei CloudEC platform, students at the Coffs Harbour campus are now able to remotely attend courses taught by teachers located at the Sydney campus and attend course lectures in real time. Cross-disciplinary and cross-regional research centers will collaborate more efficiently. Researchers at the Marine Research Ecology Centre and the Centre for Coastal Biogeochemistry Research will better communicate research results, share research experiences, and encourage additional research. Full and efficient connections are only the first steps in the digital transformation of higher education. In the future, SCU will continue to innovate and use cutting-edge technologies to promote the development of teaching and scientific research to improve the teaching and living experiences for faculty and students. SCU has become the guiding star of Smart Education in the southern hemisphere.